The Best Paleo Brownie Crinkle Cookies made with nut-free and gluten-free ingredients for an easy and healthier crinkle cookie recipe! 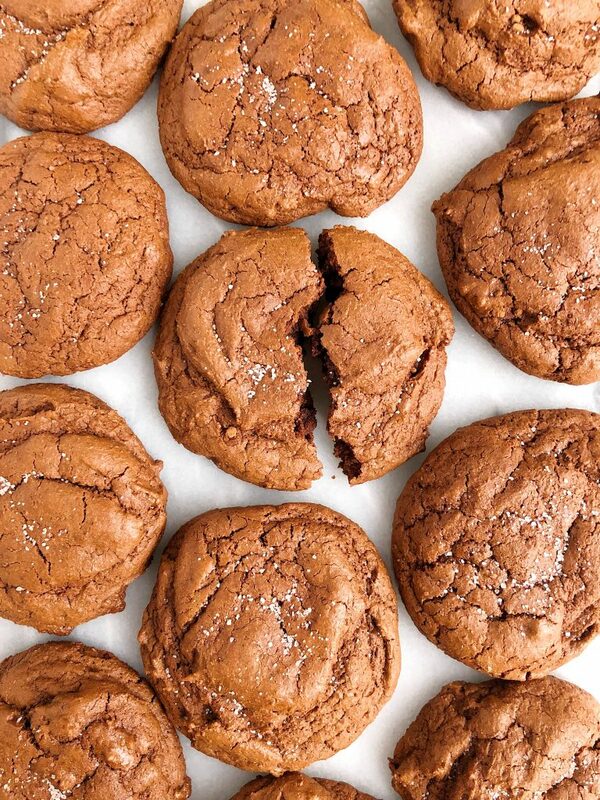 These Paleo Brownie Crinkle Cookies are HERE! Might I add, they are one of the very few cookies on the blog with a crunch. Yet the inside as a soft chocolate-brownie center. One of the downsides to Jord working late, is he is never home for dessert aka I eat all of the desserts unless I share with a friend. Except these bad boys were too good, I personally ate the entire batch besides the 2 I froze for my parents to try (so generous.. ha!). I have a feeling these cookies are going to be a hit with you guys and that is for a few reasons.. They are grain-free, nut-free, gluten-free and dairy-free. Super allergy-friendly for most and for a nut-free cookie to also be paleo, isn’t the easiest to create. I know many of you have nut-free family members or cannot eat nuts yourselves, so I have been testing more and more recipes that are free of nuts for ya! I use a mix of pasture-raised eggs (I don’t recommend flax eggs here, sorry guys!) and coconut sugar and add in some of my beloved Hu Kitchen Salty Dark Chocolate that is all melted and rich and chocolatey. For the flour we are using coconut flour and it really helps thicken up the cookie batter, so no worries if the batter is looking way to liquidy at first. Once you add the cacao, coconut flour and baking powder, it’ll thicken up for sure. I recommend a sprinkle of sea salt on these cookies too. 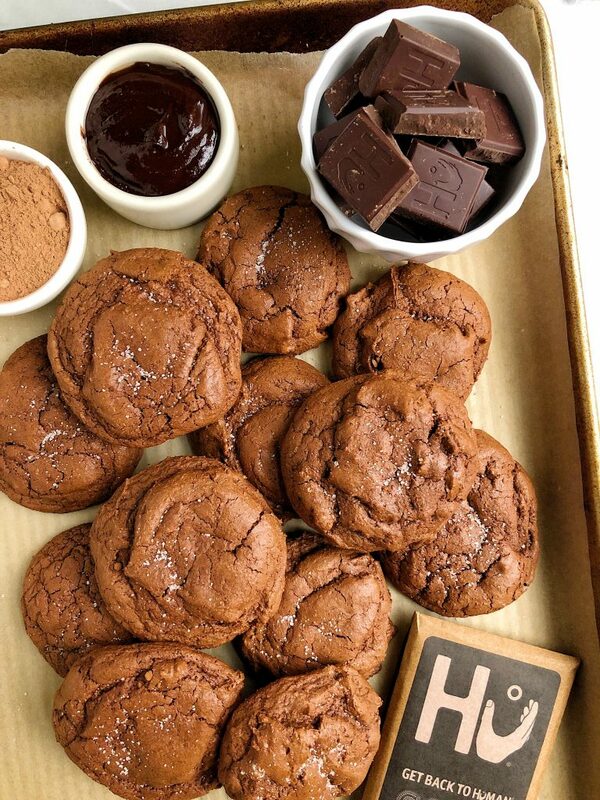 It adds the perfect little saltiness and pairs so well with the sweetness of the chocolate. These cookies are also perfect for a little sweet treat for your friends and loved ones for Valentine’s Day. In case you are craving some other brownie-like recipes, here are a few of my other faves from the blog: Gluten-free Chocolate Chip Cookie Brownies, Paleo Deep Dish Double Chocolate Chunk Brownies and Paleo Dark Chocolate Brownie Bread (vegan). Can you use regular vegetable oil or melted butter instead of the coconut oil? i don’t personally cook with vegetable oil but i think melted butter or ghee would be great! These were really delicious! made them today to take camping!! Followed recipe except I subbed chocolate chips for the chocolate bar! I have given up trying to find a gluten free chocolate chip cookie that is close enough to the real deal in texture, so this is a nice diversion, really yummy and I don’t have to be disappointed that its not quitttttte the chocolate chip cookie Im searching for! Thanks for a great recipe! I made these for a party and they were such a hit! Nobody could tell that they were gluten free, and everybody loved them! Plus they’re so easy to make. Anything with HU Chocolate is amazing! I cannot wait to make these. Thanks for always sharing such delicious, chocolately treats! These cookies are OFF THE CHARTS DELICIOUS. I’ve made them 4 times in 2 weeks (don’t judge) for group gatherings and myself!! 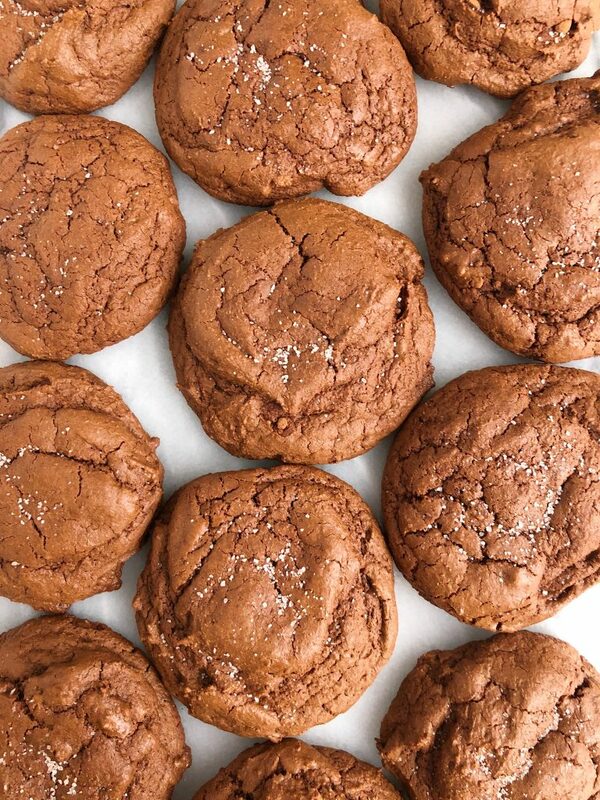 They are the perfect texture and super chocolatey. Now I need to make all of your cookies! I did around 3oz of chocolate and used flax eggs! Turned out perfect so good and so rich!